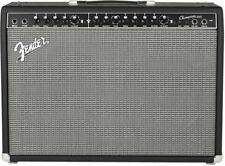 Featuring 100 watts of power through Dual 12” Fender Special Design speakers, Two channels, single input, Reverb, delay/echo, chorus, tremolo, Vibratone and other effects. Different amp voicings and distortion types 1/8” auxiliary input and headphone output jacks.Amp modeling. 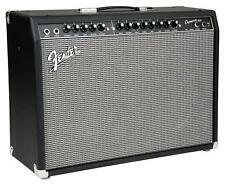 Fender Champion 100 watt amp. Amp is used but in good condition. Shipped with USPS Priority Mail Large Flat Rate Box. Dual-Channel Guitar Amp Footswitch. 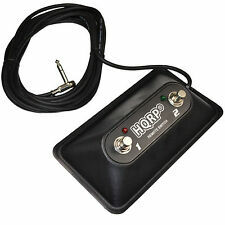 HQRP® Dual-Channel Footswitch with LED;. 14' cable provides the wide usage area. Right angle 1/4" plug does not cause the bending of the cable near the connection. Footswitch ampli guitare bicanal. 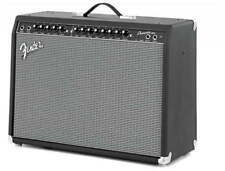 Fender FM 65 DSP / Champion 100. Compatible avec les suivants P/N: Fender 0071359000 / 0994058000 ;. Compatible Models Fender FM 65 DSP Champion 100. Compatible P/N Fender 0071359000 / 0994058000. ERGONOMISCH: Der Fußschalter hat schräg oben die Push erleichtert. Rechten Winkel 1/4" Stecker eignet sich zur Anwendung. 14' Kabel bietet das breite Einsatzgebiet. Rechten Winkel 1/4" Stecker bewirkt nicht die Biegung des Kabels in der Nähe der Verbindung. Fender FM 65 DSP, campeón 100 amperios 0071359000 / 0994058000 recambio. Fender FM 65 DSP / 100 del campeón. 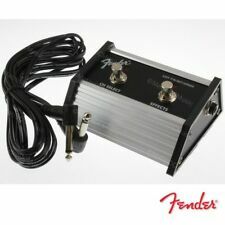 Pedal de guitarra dual-Channel Amp. Compatible con los siguientes P/N: Fender 0071359000 / 0994058000;. Dual-Channel Guitar Amp Footswitch for Fender FM 65 DSP Champion 100. Condition is New. Shipped with USPS Parcel Select Ground.